As you can see, this output is the mixin itself and the CSS ruleset. If you don’t want mixins to appear in your compiled .css file just add empty parenthesis after the mixin name. you may wonder why I’m using a capitalized letter for the mixin names. This is because CSS class selectors also use the dot symbol and there is no way to differentiate it from a Less mixin name. That’s why I usually use capitalized letters, as in object oriented programming, which uses capitalized letters for classes. And it will include a 5px border-radius. When you mix in a mixin, all the available mixins of that name, in the current scope, are checked to see if they match according to what was passed to the mixin and how it was declared. Now if we call .mixin with a single argument, we will get the output of the first definition, but if we call it with two arguments, we will get the second definition, namely @a faded to @b. Where the color passed to .mixin was lightened. If the value of @switch was dark, the result would be a darker color. Only mixin definitions that matched were used. Variables match and bind to any value, and anything other than a variable matches only with a value equal to itself. Another way of restricting when a mixin is mixed in, is by using guards. A guard is a special expression that is associated with a mixin declaration that is evaluated during the mixin process. It must evaluate to true before the mixin can be used. Guards are useful when you want to match on expressions, as opposed to simple values or arity. We use the when keyword to begin describing a list of guard expressions. The full list of comparison operators usable in guards are: >, >=, =, =<, <. Think Math is Bad? Think Again. Are some elements in your stylesheet proportional to other elements? Operations let you add, subtract, divide, and multiply property values and colors, giving you the power to create complex relationships between properties. Rather than add more variables, you can perform operations on existing values with Less. You can build expressions with any number, color, or variable. If you’d like to explore color alchemy further, we’ve got a new guide on creating Less color schemes and palettes with more details! Do You Love Hierarchy? Yes, I Do. As you can see, this gives you clean, well-structured code, represented by a strong visual hierarchy. Now you don’t have to repeat selectors over and over ever again. Simply nest the relevant ruleset inside another to indicate the hierarchy. The resulting code will be more concise, and mimics the structure of your DOM tree. If you want to give pseudo-classes this nesting structure, you can do so with the & operator. The & operator represents the parent’s selector. It’s used when you want a nested selector to be concatenated to its parent selector, instead of acting as a descendent. Name It, Use It, and Re-use It. Is It That Simple? What if you want to group mixins into separate bundles for later re-use, or for distributing? Less gives you the ability to do that by nesting mixins inside a ruleset with an ID, like #namespace. Remember to add empty parentheses when you define mixins, which don’t take parameters. This way the initial definition isn’t included in the rendered CSS, only in the code where the mixin is being used. This both shortens your output code and allows you to keep a library of definitions that don’t add to the weight of the output until they are actually used. I’m Ready. Show Me the Magic, Please. Here I will explain to you how to work with WinLess. First, download and install it. 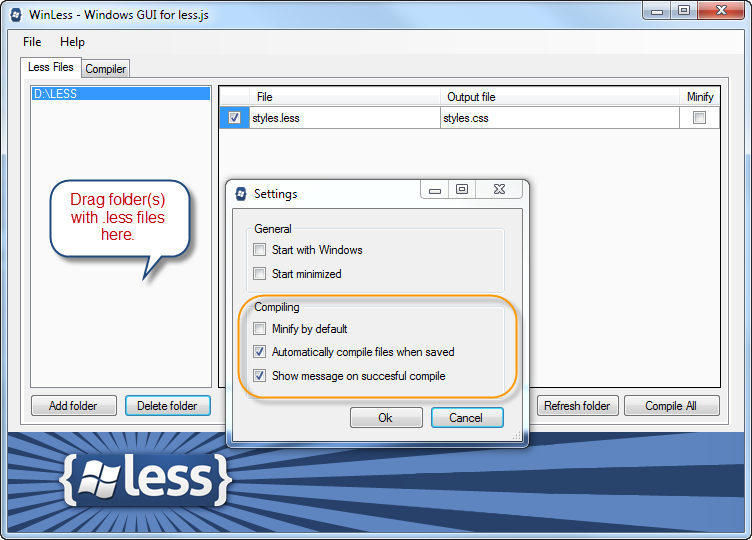 When you launch WinLess all you need to do is to drag a folder with .less files inside, and you are ready to go. To configure WinLess behavior, open File > Settings. I leave "Minify by default" unchecked because I want my file to be readable and minify my files only when I’m outputting for production. I check the other two options below because I don’t want to compile manually every single time I save a file, and because I want to know whether the compile is successful. By the way, for the training purpose you can use the WinLess Online Less Compiler—ideal if you want to quickly try out something. For working with LESS.app, you can check the video tutorial on its website’s home page. There is one more option for those of you who don’t use PC or Mac. You can get Crunch!, which is a cross-platform AIR application. Crunch is not only a Less compiler, but also a Less editor. 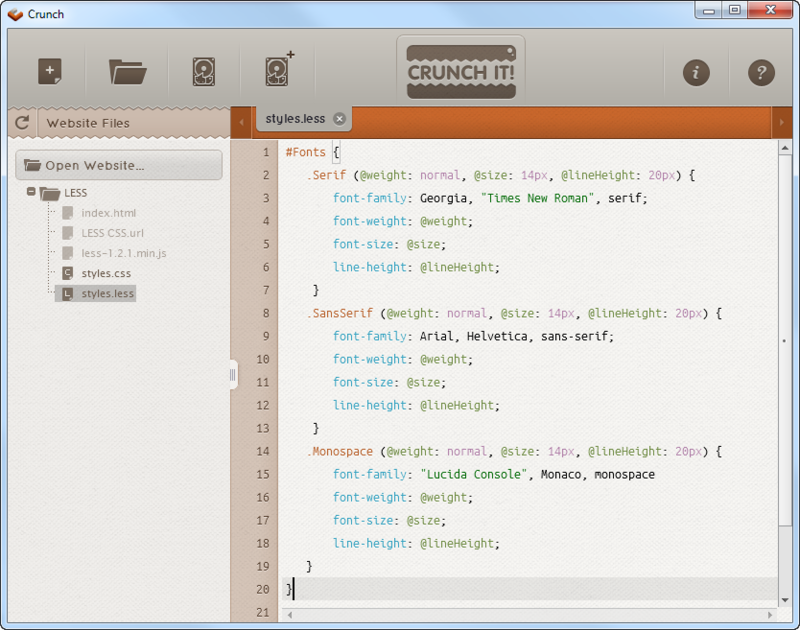 This is cool, because Crunch is the only editor, to my knowledge, which gives you syntax highlighting for .less files. Try it to see what I mean. You know what? I’ll tell you my little secret. Actually, I’m using both of them—WinLess for compiling, and Crunch for editing. Sounds cool, huh? OK. I’m Really Fascinated. Where do I Find More? Here is a little bonus for you. This is a short list of Less resources, which can be used in your projects right away. There are some ready for use Less mixins and variables, plus a couple of projects which use Less as their base. Official Less documentation—OK. This can’t be used in your projects :) However, you should check it regularly for any updates and new features added to the language. Less Elements—a collection of useful Less mixins. Preboot.less—another collection of Less mixins and variables. Semantic Grid System—a simple and easy to use page layout tool. It supports Fixed, Fluid, and Responsive layouts. And, by the way, you can use it with Sass and Stylus too (if you still haven’t fallen in love with Less). Centage—if you need full fluidity and flexibility, you should definitely check this. perkins CSS3 Less Framework—a nice and rich Less framework, which uses HTML5 and CSS3. If you want to find even more resources about Less, GitHub is the right place to go. As you will see, there are plenty of Less goodies there. So, what are you waiting for? Go and check them out. And if you enjoyed reading this post, you’ll love Learnable; the place to learn fresh skills and techniques from the masters. Members get instant access to all of SitePoint’s ebooks and interactive online courses, like Launch into Less. Comments on this article are closed. Have a question about Less? Why not ask it on our forums?